Seam repair is yet another service that Lone Star Carpet Care and Restoration offers to San Antonio and surrounding areas. We understand that you want seamless wall-to-wall carpet, whether it’s brand new or many years old. We can help! Carpet is usually sold in 12-foot rolls. In large rooms, installation will require the carpet to be sewn together. When carpet flows from one room to another, doorways and entranceways can also present installers with another reason to have to seam the carpet together. As a matter of fact, doorways are the main area where seams will begin to separate because they are narrow, so they get lots of foot traffic, and doors slide past the seams constantly. When done correctly, carpet seams should not be detectable, no matter whether it is a new installation or seam repairs like the ones done by Lone Star Carpet Care and Restoration. Often, seam repair is a part of a bigger carpet care plan which Lone Star Carpet Care and Restoration will work out with you when one of our professional staff come out for an evaluation. For example, we usually need to do seam repair after we do carpet stretching or carpet patches. Both processes require us to cut out a piece of the existing carpet then either reattach an original seam or to a new patch. Seam repair is something we do all the time, so we’re excellent at it! Some cases of seam repair – like the ones we just mentioned – are because damage has been done to the carpet. If a seam begins to loosen on its own, practically anything could snag one side or the other side of the seam and create a big rip. Other times, though, seams will need to be repaired simply because carpet very old and it begins to wear out. Carpet itself is not meant to last for 25 or more years, but if it’s in a low-traffic area, and if it’s taken care of well, it just might. The glue and tape used to attach the carpet, however, might not. Even high-quality products will deteriorate given enough time. And, we hate to say it, but there’s the unfortunate event that your carpet was installed improperly or with mediocre products. In that case, the seams will come apart much sooner than they should. Lone Star Carpet Care and Restoration is happy to repair work done by others who may be more careless or less knowledgeable than we are. 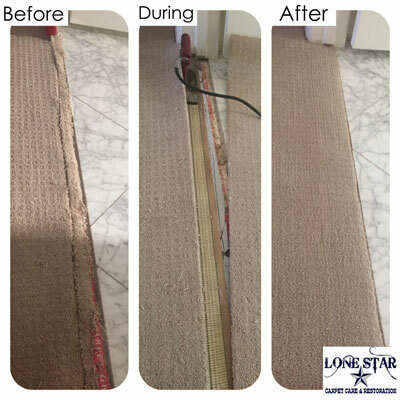 Seam repair is another service that Lone Star Carpet Care and Restoration provides which is not nearly as complicated as our clients might think. However, it isn’t something you want to attempt on your own. When you see a small hole or tear in your carpet and suspect that a seam may be coming loose, simply pull up the edge just a little. If you see something that looks like tape, it’s definitely a loose seam. It’s time to call Lone Star Carpet Care and Restoration! Carpet is our business!